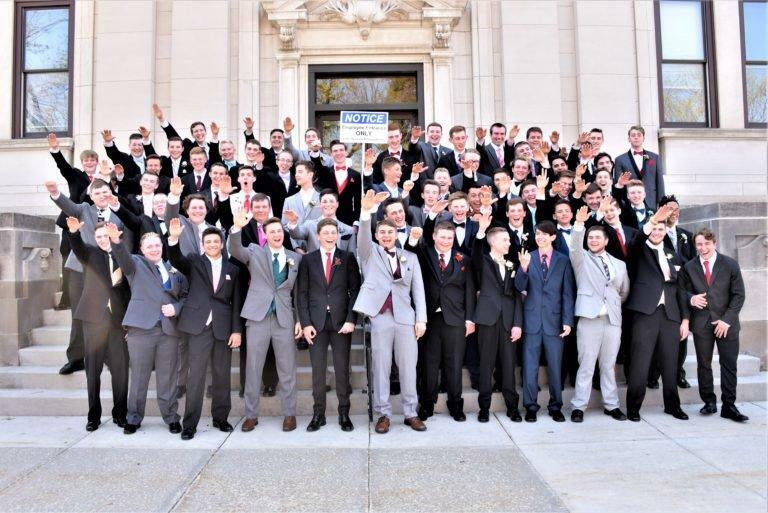 A Wisconsin school district is investigating a photo showing a group of high school boys apparently making the Nazi salute. A school official denounced the image on Twitter – and said it would pursue legal actions if necessary. Baraboo Superintendent Dr. Lori Mueller said she became aware of the photo, which shows over 60 male students dressed in suits with their right arms extended upward, on Monday after it was posted on social media and received immediate backlash. "The photo of students posted to #BarabooProud is not reflective of the educational values and beliefs of the School District of Baraboo," she said in a statement. "The District will pursue any and all available and appropriate actions, including legal, to address." She added, "the Baraboo School District a hate-free school environment where all people ... are celebrated and respected." Mueller said the photo appears to have been taken last spring and wasn't on school grounds. Baraboo police are also investigating. The photo of students posted to #BarabooProud is not reflective of the educational values and beliefs of the School District of Baraboo. We are investigating and will pursue any and all available and appropriate actions, including legal, to address. A photographer with Wheel Memories took responsibility for taking the controversial snapshot at a prom event and offered an apology. "It is too bad that there are those in society who can and do take the time to be jerks; knowingly and willingly to be jerks!" the post on the the company's website read. "To anyone that was hurt I sincerely apologize." CBS News has reached out for further comment. One of the students, however, did not take part in the apparent salute. Jordan Blue, an 18-year-old seen pictured in the top right corner, said in a text message to CBS News: "The photographer took the photos telling us to make the sign, I knew what my morals were and it was not to salute something I firmly didn't believe in." The Auschwitz Memorial tweeted about the photo, "This is why every single day we work hard to educate. We need to explain what is the danger of hateful ideology rising. Auschwitz with its gas chambers was at the very end of the long process of normalizing and accommodating hatred." Late Monday, a group of students had gathered in the same place where the picture was taken, but this time the message was to promote love. Baraboo is a town of about 12,000 residents, about 115 miles northwest of Milwaukee. Jericka Duncan contributed to this report.